Frustrated that my Target doesn't have Goodwin in yet, I was curious to see if they sold blasters on their website, Target.com. Seemed to make sense that they would given that some Targets are carrying the brand and some aren't yet. No dice. BUT, check out what I did stumble upon . . . .
We're thrilling new and seasoned collectors alike by offering an authentic piece of history. Now available though patent-pending GGUM Card Technology, you can own a genuine piece of memorabilia and a matching mint "10" Beckett Graded Trading Card encased by Beckett into a sonically sealed acrylic case for authenticity and protection. 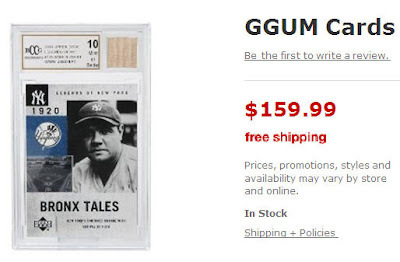 This package includes a perfectly graded Beckett Grading Services mint "10" Babe Ruth trading card and an actual piece of a Babe Ruth game-used bat. Since every GGUM card is unique, trading card and memorabilia may differ or have different characteristics than pictured. For those of you who are unaware, BCCG was originally created for one of the Shop at Home TV channels to provide a way for the likes of Ken Goldin and Don West to be able to pawn off "GEM MINT 10!!!" graded cards. In actuality, they are often anything but a 10 by real grading standards, and utilize a grading scale with less stringent criteria. In addition, if anything defines why it may be time for "game-used" material to be authenticated by a 3rd party source outside of the manufacturers and grading companies themselves, this is it. I just question the authenticity of said game used bat piece. I think they should at least specify the differences in grading types. James, do they display the differences in dogfood types? @Random - Good point. I think if they are targeting new collectors, they could provide some small copy with the difference between the two. I am in NO way blaming target. I am simply pointing out another venue which Beckett has found to dump this crap on buyers who wouldn't know any better. Plus I really question the game used Ruth and Ted Williams bats. If I'm not mistaken, I think that is one of their standard grading options...to have memorabilia put into the slab. If a dollar is to be made, they will find a way. Here is an honest review of BCCG !